UHU-Linux is the leading distribution of Linux in Hungary. It is primarily intended for Hungarian users, thus special care is taken to support the Hungarian language as much as possible. Ease of installation and sane default settings both help new users of Linux and make veterans feel comfortable. Usability as the main goal involves having all the cutting-edge yet stable releases of Open Source packages, with dpkg as the package manager. Development is completely open and everyone is invited to join. Tips and tricks: Running openSUSE "Factory"
Rate this project Peppermint OS is a lightweight distribution based on Lubuntu. The Peppermint team has released a new minor update to the project's version 8 release. The new installation media features bug fixes and an updated version of the Linux kernel. "This is a security refresh of the Peppermint 8 ISO images to include all updates to date (as of 3rd Feb 2018), including the Meltdown and Spectre mitigations such as the new HWE kernel 4.13.0-32 and the latest Chromium web browser version 64. The new ISO also contains bug fixes for flash content in ICE SSB's, and Chromium not remembering user selected xdg-open preferences for magnet and mailto links. There is no need for Peppermint 8 or Peppermint 8 (first) Respin users to reinstall this version, the mitigations and bug fixes have already been pushed as automatic updates to the earlier Peppermint 8 versions. Peppermint 8 Respin-2 is still available in 32-bit and 64-bit editions, with the 64-bit edition having full UEFI and Secureboot support." A list of changes and fixes can be found in the project's release announcement and in the release notes. Download (SHA256): Peppermint-8-20180203-amd64.iso (1,272MB, signature, torrent, pkglist). Peppermint OS is a Lubuntu-based Linux distribution that aims to be lightning fast and easy on system resources. By employing its Site Specific Browser, Peppermint integrates seamlessly with cloud and web-based applications. The distribution's other features include automatic updates, easy step-by-step installation, sleek and user-friendly interface, and increased mobility by integrating directly with cloud-based applications. The distribution employs a hybrid LXDE/Xfce desktop environment, mixing LXDE's lxsession with Xfce's panel and application menu. Mark Greaves has announed the release of an version of Peppermint OS 9. Peppermint OS is a lightweight distribution based on Ubuntu and featuring a combination of local and web-based applications. The new version is based on Ubuntu 18.04 LTS and offers a number of improvements: "Swapped VLC for Xplayer (we've had reports that VLC has been getting a little 'flaky' for some users over their last few releases). Removed the Linux Mint 'Levels' from mintupdate (in line with our update policy, not Linux Mints). Fixed the ICE applications 'Where in the menu ?' category names, so they now match the Xfce Whisker Menu categories (i.e. 'Sound & Video' renamed to 'Multimedia', and 'System Tools' renamed to 'System'). Added 'Accessibility Settings' utility to the Peppermint Settings Panel 'System' Category. Added 'Enable/Disable Neofetch' utility to the Peppermint Settings Panel 'Tweaks' Category. Added 'System Information' utility to the Peppermint Settings Panel 'System' Category. Added a 'Transparent' wallpaper (so users can now set solid colour backgrounds via the 'Wallpapers' utility)." Further details can be found in the project's release announcement. Download links and checksums are available on the distribution's home page. Download: Peppermint-9-20181222-amd64.iso (1,356MB, signature, torrent, pkglist). Peppermint OS is a lightweight, Ubuntu-based distribution that features a desktop environment made up of Xfce and LXDE components. The project's latest release, version 9, is based on Ubuntu 18.04 LTS and features several small changes. "We have replaced lxrandr with xfce4-display-setttings for monitor settings as we continue to look for better options that add functionality without adding weight, and to continue the migration away from the few remaining LXDE components. By user request the Menulibre menu editor is now installed by default, and no longer breaks the menus as it did in previous Peppermint versions. Continuing the theme of improved menu and launcher management, there is now a right-click 'Create new launcher here' desktop context menu item. The Nemo file manager now has a right-click 'Send by email' context menu item. (requires an email client such as Thunderbird to be installed). The Panel Reset function in the Peppermint Settings Panel no longer needs to log you out of your session to reset the panel. The Xfce Panel Switch utility is now installed by default, so you can now backup/restore any custom panel configurations and switch between them. It includes a Peppermint-9 default profile and a few others to play with." A complete list of changes can be found in the release announcement. Downloads can be found on the project's home page. Download: Peppermint-9-20180621-amd64.iso (1,311MB, signature, torrent, pkglist). Mark Greaves has announced the release of an updated build of Peppermint OS 8, a lightweight distribution based on Lubuntu (the long-term support branch) and featuring the LXDE desktop: "Team Peppermint is pleased to announce the latest iteration of our operating system, Peppermint 8 Respin, which still comes in 32-bit and 64-bit variants, with the 64-bit variant having full UEFI and Secureboot support. Whilst a respin is generally a minor release intended as an ISO image update, the Peppermint 8 Respin does contain some significant changes: Nemo 2.8.7 updated to 3.4.7 which seems more stable during large file operations and now has a separate process for controlling the desktop; OpenVPN updated in the repository to version 2.4.4 to support mixed mode IPv4/IPv6 VPNs; switched to slick-greeter, a much prettier login screen and a GUI utility in the menu called 'Login Window' for login screen settings, including the ability to add, change, remove an auto-login user; added a desktop right-click 'Open Peppermint Settings Panel' context menu item...." Read the rest of the release announcement for a complete list of changes. Download (SHA256) links: Peppermint-8-20171130-amd64.iso (1,266MB, signature, torrent, pkglist), Peppermint-8-20171130-i386.iso (1,189MB, signature, torrent). Mark Greaves has announced the release of a new version of Peppermint OS, a lightweight distribution based on Lubuntu. The new version, Peppermint OS 8, includes both UEFI and Secure Boot support on 64-bit computers. The project's site Specific Browser feature supports a range of web browsers, including Chromium, Chrome, Firefox and Vivaldi. "Peppermint 8 (Peppermint-8-20170527) highlights: Still based on the 16.04 code base, but now with the 4.8 kernel series and upgraded graphics stack via the HWE offering rolling kernel and graphics stack upgrades as they become available upstream. Mesa 17.0.2 for an improved gaming experience. 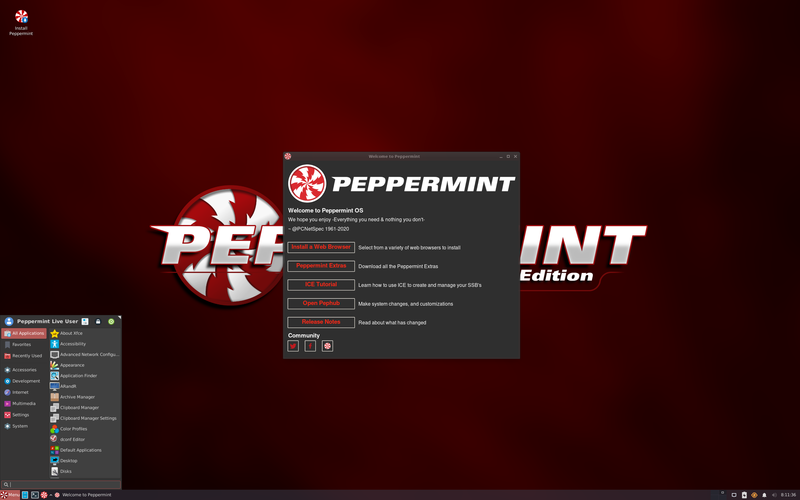 The Peppermint 8 ISO images now have an 'OEM Install' option, allowing computers to be shipped with Peppermint pre-installed (and with additional software pre-installed) where the user will be prompted for their own language, location, keyboard layout, and account details on first boot, allowing the system configuration to be unique to the new owner. Talking of keyboard layouts, in response to user requests Peppermint 8 now has much improved keyboard layout handling, including the ability to easily configure then swap between multiple layouts from the system tray." Additional features and changes can be found in the release notes. Download (SHA256): Peppermint-8-20170527-amd64.iso (1,227MB, signature, torrent, pkglist). 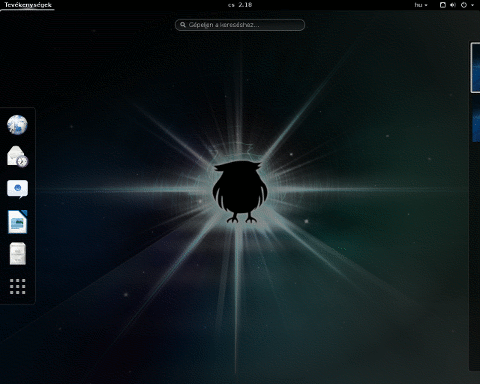 Peppermint OS is a lightweight, Lubuntu-based Linux distribution. The Peppermint team has announced the release of an update (respin) to the project's version 7 installation media. The new media offers a update to the Linux kernel, fixes multimedia keyboard keys, includes better HP printer support through the hplip package and includes support for Bluetooth headsets. "Peppermint 7 Respin (Peppermint-7-20161129) Improvements: all updates to date (including the 4.4 kernel); fixed multimedia keyboard function keys; fixed browsing for Samba network printers; fix for Google Chrome keyring prompt; added hplip for HP Printer support out of the box; added PulseAudio Bluetooth module for Bluetooth headsets; update manager will not prompt to upgrade to the next 'Ubuntu LTS' version by default; 'Firefox Themer' name changed to 'Firefox Theme Lock' to remove confusion over its function." Further details can be found in the project's release announcement. Peppermint OS downloads, signatures and checksum information can be found on the project's home page. Note: Due to an issue with the original ISO, the Peppermint OS team has released an updated spin linked to here. Download: Peppermint-7-20161201-amd64.iso (1,165MB, signature, torrent, pkglist). The developers of Peppermint OS have announced the launch of a new version of the lightweight Ubuntu-based distribution. The new version, Peppermint OS 7, is based on Ubuntu 16.04 and uses LXDE as the default desktop environment. "Team Peppermint are pleased to announce our latest operating system Peppermint 7. It comes in both 32-bit and 64-bit editions with the latter having full UEFI/GPT/Secure Boot support baked in, a new version of Ice (our in-house Site Specific Browser framework) is also included with full Firefox web browser support, as well as Chromium. Along with the shift to the 16.04 code base, Peppermint 7 continues our policy of choosing the best components from other desktop environments, wherever that may be, and integrating them into a cohesive whole with our own software. This time around, whilst staying with LXDE core session management for lightness and speed, we've listened to our users who demanded a more modern, functional, and customizable main menu and switched out LXPanel." Additional information can be found in the project's release announcement and release notes. Download (MD5): Peppermint-7-20160616-amd64.iso (1,054MB, signature, pkglist). Mark Greaves has announced the release of an updated build of Peppermint OS 6, a lightweight Linux distribution based on Ubuntu 14.04 and featuring the Xfwm window manager with the LXDE desktop environment: "Team Peppermint is pleased to announce a respin of our latest operating system, Peppermint 6, with full UEFI, GPT and Secure Boot support (64-bit edition only), and a new version of Ice (our in-house site-specific browser framework) that now supports the Firefox web browser as well as Chromium and Chrome. We've fixed a few minor bugs and tweaked the Peppermix-Dark theme a little in line with user feedback. And all updates to the original Peppermint 6 respin are also included in the respin. The Peppermint 6 feedback we've received so far has been overwhelmingly positive, so we've not made any major software or UX changes this time around, we hope the UEFI support opens up Peppermint 6 to a whole group of users and we'd love to hear from you at the Peppermint forum." Read the rest of the release announcement for a more detailed list of changes and improvements. Download (MD5): Peppermint-6-20150904-amd64.iso (713MB, pkglist). Mark Greaves, lead developer of the Peppermint OS distribution, has announced a new release of the Ubuntu-based distribution. Peppermint OS Six offers users an updated Linux kernel (version 3.16), the VLC multimedia player and the Nemo file manager. "Peppermint is excited to announce the launch of our latest operating system Peppermint Six in both 32-bit and 64-bit editions. The downloads are live now via our standard download links and are also available for purchase on pre-installed LiveUSB sticks from our shop. Breaking from our usual strategy of annually basing on Ubuntu '.04' releases, Peppermint Six stays with the 14.04 code base but moves to the 3.16 kernel and updated graphics stack via the LTS enablement stack. Other major changes include moving to the Nemo file manager with a new wallpaper manager, VLC as the new `one app to play them all' media player, and changes to the terminal, power-manager, search tool, and screenlock. Amongst a plethora of other smaller changes and additions, you'll find our new gtk/Xfwm4 theme 'Peppermix', and as requested by our users the addition of a brand new dark theme 'Peppermix-Dark'." More information is available in the release announcement and in the project's release notes. Download (MD5): Peppermint-6-20150518-amd64.iso (665MB, pkglist).